The Innokin Plex features a 4ml e-Liquid capacity with a push-to-open top filling cap which makes refill easier and faster and solves the leaking problem. The Innokin Plex features a 4ml e-Liquid capacity with a push-to-open top filling cap which makes refill easier and faster and solves the leaking problem. The Plex tank includes the 0.13 ohm Plexus coil, which also fits the original SCION and the SCION II. The triple-core Plexus will give you better flavor. 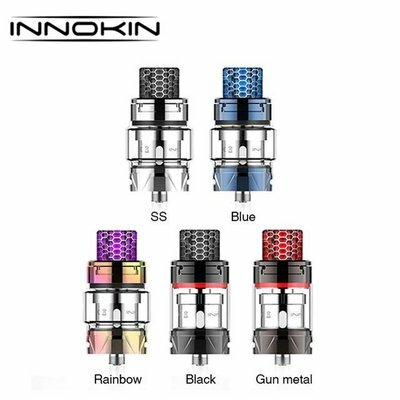 Made of high quality stainless steel and pyrex glass and equipped with a beautifully color-coordinated resin 810 drip tip, the Innokin Plex tank will give you an amazing vaping experience!